Why did I come to Bali for a spiritual journey? I have set out on a spiritual journey to Ubud, Bali, Indonesia on my own, at age 29. Do I feel like I need to find myself? No. Am I unhappy? No. Am I confused? No. Do I lack direction in life? No. So why the need to search for something more? I am happily married, with a job I enjoy and I have amazing family and friends. I know who I am and what I want from my life and what I do and dont enjoy. I'm well traveled with a wealth of personal experience and knowledge. So I wouldn't say that I was searching for something 'more' to complete my life as I have all I could ever need right now. The search for 'more' is really an openness to what the universe wants me to know. Everyone has different beliefs as to why we are on this Earth and some people just don't know, or don't even care. And that's ok. I believe that everyone has the right to believe what they want to, and make their own choices. We are all on our own journeys in life and everything we experience is what is meant to happen in this lifetime. Yin and Yang represents the balance of duality in everything. For there to be someone who believes that anything is possible, there must be someone who doesn't. Ultimately though, it all equals oneness. However, that's another topic altogether! I digress. I have experienced many great pains throughout my life, but who hasn't? I handled it in many ways - escapism, denial, anger, depression, being dramatic, playing the victim etc But it all let to where I am right now. I developed a thirst for knowledge as to how the brain works and how emotions and the mind control our lives and I looked into psychology and spirituality. Thanks also to an incredible mother, I learned acceptance, forgiveness, logic, understanding and compassion - to myself and to others. Over time I let go of past hostilities, hurt and blame as I knew that it only made me suffer and those around me so why hold on to it? I didn't really dive head first into spirituality until I was already on my way to wholeness. My husband came into my life 5 years ago and the calmness within me intensified. He showed me that it is possible to be in a relationship that seems almost effortless, that feels right on every level and where we can allow each other to be who we are without judgement or forcing change. I obviously attracted him into my life because I was ready to share my love with a partner without loosing myself in the process. Its from this happy and secure place that my spiritual journey seems to have hit fast forward. I always thought that I wanted to be an Event Manager. I am an organiser and perfectionist by nature and I thought it suited me to a tee. And if I'm honest, its also an image that I thought was ' cool ' to the outside world. After many years of bullying through school, I wanted to be important and special. I wanted people to like me. A part of me still does but I'm aware of it now and I don't allow those thoughts to drive me as much. I've wanted to be an Event Manager for 15 years and I dabbled in it over the years but life always took me in a different direction. I worked hard for my money, and traveled the world, then met Andrew and moved my life to Australia. Once I'm a citizen I can finally study to be an Event Manager (around working full time), but I suddenly realised that I didn't want too anymore. I started to think about what was important to me and if I didn't HAVE to work for money, what would I do? I love to write, to dance, to practice yoga, to exercise, to spend time with family and friends and of course my greatest passion - to travel. I also want to help people feel good about themselves and to show them the light that is available to everyone. After being in darkness myself, I know how important guidance is from others who have already traveled that road themselves. I have a handful of inspirational friends who have become yoga teachers. One in particular who has had a complete life transformation that blew me away. Her newfound path resonated within me. Seemingly out of no where, yoga was calling to me with large flashing letters. It was the next necessary step for my spiritual development. I've always enjoyed yoga and have practiced it for many years in conjunction with dancing and going to the gym. I watched some friends complete a 30 day yoga challenge and thought how much fun that would be but I didn't want to give up the rest of my fitness routine. I didn't believe that yoga would be enough (Boy, was I wrong!). My goal last year was to run a half marathon however I kept injuring myself. I wasn't listening to my body and I was being pushed in the direction where I had to learn this vital lesson. I decided to enroll myself into a 200hr yoga teacher training at Yoga-Me, Frankston which meant that I did yoga every day for 5 months. In the last year spiritual books kept ending up in front of me, messages kept coming from everywhere and I started listening. I started to meditate and the messages became clearer and stronger. I have meditated in the past but the practice didn't stick as I wasn't mentally ready for the development. Now it is a vital part of my day, even just 10-20 minutes makes all the difference to a busy mind. And seriously, my mind needs it. I've always said I need traffic lights installed in there! One particular yoga studio was recommended to me - Radiantly Alive and that is where I plan to spend most of my yoga time. 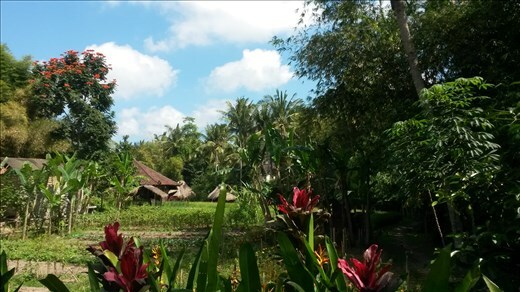 Ubud is the perfect place for me to develop trust in my intuition and to be open to further knowledge, and to let go of any unconscious pain that my body and mind may be holding onto. Also coming here alone plays a big part. Because of past ingrained insecurities, I have held the belief that if I am alone or not busy then I am a nobody. It is important that I let go of that toxic thought. I am happy to be here and I am enjoying my own company. It's also one of the reasons that I didn't come on a pre-organised retreat as I wanted to figure things out on my own and only have myself to rely on. Its nice to not HAVE to be anywhere or HAVE to do anything and just flow with how I feel at this present moment. I arrived yesterday afternoon and explored a little to get my bearings. Had an incredible massage to let go of the tension in my shoulders and neck (for only $9! Unreal. If it was that price back home I would get one every week!). Then I slept. ALOT. I needed it. Now my official Day One begins. I am very grateful to be here and am looking forward to all the experiences this magical place has in store for me. Im prepared for it to include an onslaught of emotions as well.